The story I am going to tell you is from 2003. However, last week I was in Singapore and someone gave me some money I was reminded about the miracle which happened and I re-told the story to many of my friends to encourage them in the power of God. In 2003 my father was killed by terrorists. I also had an opportunity to complete my first Master’s degree in Singapore. It was a difficult time for me. For 4 months I lived away from my family while I studied, and rarely slept, in Singapore at Bethany International University. I needed to pay the tuition, but the school was kind enough to let me pay as I had funds, so I would pay sporadically as I had money to give. One day I was sitting and praying in our chapel when I heard God’s quite voice say to me, “Give the school $1,000 today.” The night before I had been with a friend who slipped me a “yellow one” (a $100 bill). The Singapore dollar trades at $1.2o Singapore Dollars to $1.00 USD. I only had one bill in my wallet. I knew that. I had nothing else. Yet, in my heart I felt confident I would have $1000 to pay to the school. At lunch I pondered what to do and I walked alone down the street praying, though normally all the students ate together. I decided in my heart that I would go back to our cashier (Padma) and give her my $100. However, I felt in my heart that God would somehow make it be $1000. Along the way I was expecting a miraculous intervention of a Singaporean pastor or businessman to give me more money, but there was none. I went up to Padma’s desk and told her I wanted to give her money for the school and I opened my wallet and pulled out my “yellow bill”. I looked puzzled. It wasn’t yellow anymore. I handed it to Padma and asked if it was real. It was not a $100 bill anymore. . . it had an extra zero. . . it was $1000. Did Singapore even have a $1000 bill? The cashier had never seen one and so she had to check it out too. It was real. Singapore actually prints $1000 bills! 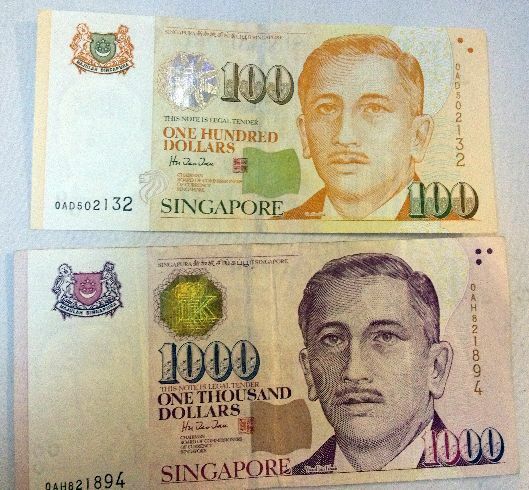 In Singapore each denomination is a different color and different size as well with the larger bills bigger than others. It was not something which could be confused. God had transformed the single bill in my wallet from a $100 to a $1000. God did a great miracle and multiplied the money. When I recalled that miracle in Singapore from 2003, I was encouraged again that God is an awesome God! I hope you are encouraged too. Jesus loves you and can meet your need anyway he wants! Great story, Steve. I love the ways in which God demonstrates His care for us and encourages us at times when we need it most. Thanks for sharing. What a wonderful testimony about our wonderful God! And what a grand precedent … Much like the one at Stairway by Ben Fitzgerald about money appearing in thin air and floating down before a pre-believers face … In this case orange $20 Australian bill(s) … God is Good! Blessings Steve! That is just the encouragement I need at this time. God is still a God of miracles. Thank you for sharing your experience with our real God.